WITH reports emerging of layoffs in various sectors, expectations of an increase in unemployment are on the rise. But as Singapore enters a fresh phase of economic restructuring, such negative changes in labour market data - a rise in unemployment or workers staying jobless for longer stretches - may in fact signal that transformation is progressing as intended at the macro level. To be sure, "high unemployment is never a good thing for any economy", DBS economist Irvin Seah cautions. High levels of joblessness can shake political and social stability, and demand higher levels of social spending - adding to fiscal pressures. 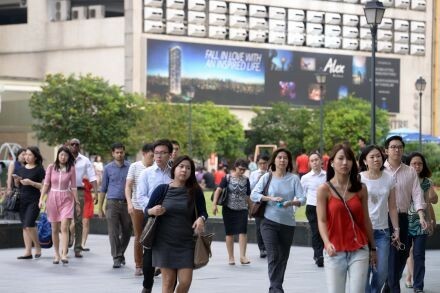 But in Singapore's context, where the unemployment rate now sits at a multi-year low of 1.9 per cent, even the combined impact of the current sluggish growth environment and economic restructuring are not likely to push jobless levels so high as to risk instability. Rather, it is a "slow drift higher" to an unemployment rate of about 2-3 per cent, that OCBC economist Selena Ling, for one, forecasts. Labour economist and nominated member of parliament Randolph Tan also believes that Singapore should expect a 0.5-1.5 percentage points increase in the unemployment rate over the next few years. Mr Tan, an associate professor at UniSIM, says that there are already signs of deterioration in the rate at which those laid off are able to find new jobs. That this re-entry rate hasn't worsened significantly to date, is thanks to the previous round of restructuring with its focus on weaning businesses off an unhealthy reliance on low cost foreign labour by hiking levies and shrinking quotas. "To a large extent, the policy tightening in the labour market over the last few years has benefited job seekers and ensured a healthy re-entry rate." With the fresh push to transform industries and seed new economic sectors though, Singapore should be prepared for the prospect that unemployment "may not return to the low levels we have enjoyed in recent years", Prof Tan says. On the other hand, should unemployment stay unusually low, that need not mean restructuring is faltering either. "By 2025, the labour force will have started to shrink, as demographics change - without considering immigration - so the supply of labour may contract," says Mr Seah. It's not unthinkable that even as the economy transforms and sheds jobs, the labour force grows leaner and the unemployment rate stays low, he says. Nuances in the labour data, rather than the headline unemployment rate or layoffs alone, will become more significant in the analysis as "Future Economy" initiatives get going. These will tell a truer story and flag labour market developments that might end up hampering industrial restructuring, economists say. "Rising layoffs is a proxy indicator of churn due to a rapidly evolving economy and industrial structure. You really need to see the flip side of the coin, which is the re-hiring rate and how long it takes for redundant workers to find alternative employment, and whether this is a higher or lower wage job, especially for PMETs," says OCBC's Ms Ling. Determining whether long-term structural unemployment is taking hold - with more workers unable to find work because of fundamental mismatches in skill - will also be important, especially in the PMET and older workers' sections of the workforce. Also, while disruptive technologies and automation will mean more skills mismatches and higher frictional unemployment become par for the course - policymakers will still need to ascertain the point at which it "becomes too painful for the individual" and offer help in the interim, Ms Ling says. The mandate of policymakers engineering this economic change after all, is to create meaningful jobs and ensure that real wages continue to rise, adds Mr Seah. There are other aspects of the labour market not captured by existing indicators, which may be relevant to assessing the success of Singapore's restructuring push. Underemployment is one, says Mr Seah. While this is a problem of cyclical weakness rather than one brought about by restructuring, it could well become an obstacle to economic change. "With the slowdown, we have observed this trend - bankers, professionals taking on jobs that are lower paying, and which require less of their skills sets. This problem of underemployment, not maximising the true potential of a worker, if amplified, becomes a problem of not maximising the true potential of the economy," says Mr Seah.